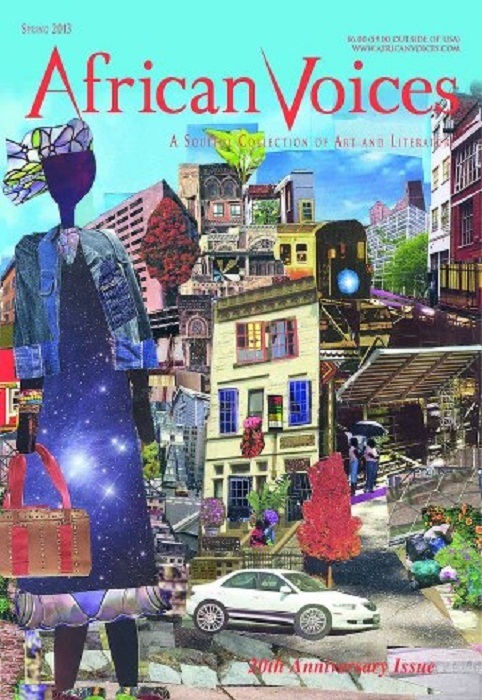 African Voices has chosen my collage, "Autumn in the City" to be the cover of their 20th Anniversary issue! This issue will be coming out in Spring 2013. I was recently part of a ground breaking art show that African Voices put together at THE Schomburg Center for Black Research in Harlem. The show was to celebrate and commemorate AV's Anniversery. Danny Simmons was the curator and chose some covers from the last 20 years! The covers are all pieces of art. The show was entitled, "Cover to Cover 20 years of African Voices." The artists who participated in the art show were Sheila Prevost, Danny Simmons, Dirk Joseph, Otto Neals, Franks Francois Deceus, Jacob Lawrence and Faith Ringgold, James Top, Elizabeth Catlett and Verna Hart. 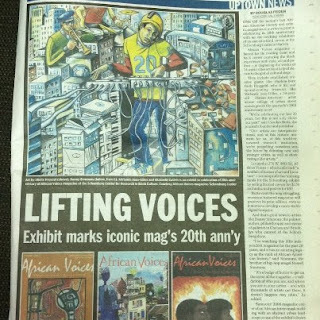 Carolyn Butts took this picture of our "Cover to Cover" show featured in the New York Daily News!! That's my hometown paper for real! I grew up reading this paper. So it was thrilling to see my name spelled right, really nice things written about me AND to see my collage in the middle there between two amazing artists who I respect very much. What a wonderful article this was! The "Cover to Cover" art opening was fabulous! The crowd was warm and energetic and a lot of folks came out to see the show. I met so many cool people. I got to talk to folks about what I love to do. It was great. I got really amazing feedback. I went to this art show without my kids, I usually will take one or both of them. This trip was solo! I was really able to chill and focus on just being there and taking it all in. I saw a lot of great folks I hadn't seen in years. It meant a lot to me to be showing my art at the Schomburg because when I was in college and even independently I used to go to the Schomburg to do research on Black history. They have old newspapers, all types of books, periodicals, artifacts that you cannot find anywhere else. They have art, art shows and all kinds of cultural events. There is so much culture and knowledge and history there. At the "Cover to Cover" art show it was so awesome and humbling to have my art work across from Jacob Lawrence's art. Here is a link to the online Daily News article.